Galway East Tourism - Kinvara Seaweed Treatment in East Galway, West of Ireland.Galway East Tourism - Kinvara Seaweed Treatment in East Galway, West of Ireland. A unique body wrap for improved health and wellbeing. 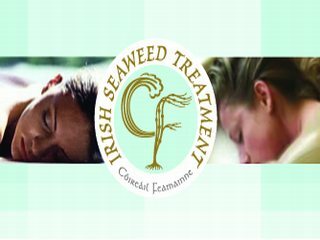 A traditional Irish seaweed treatment which has evolved to satisfy modern day needs. Harvested on the west coast of Ireland the fresh seaweed is transformed to a smooth paste for luxurious pampering. One of nature's purifiers, seaweed exfoliates and draws out impurities from the skin. Removing dead cells it cleanses and refreshes the skin. Removing dead cells it cleanses and refreshes the skin enhancing cellular renewal. This toning effect boosts circulation. Seaweed cells reflect those of human plasma and help to balance cellular energy. Seaweed is an abundant native natural resource with a history of healing. It is part of our Irish heritage with its harvesting immortalised in the paintings of artists Jack Yeats and Paul Henry. With years of research and trials the unique C?ire?il Feamainne was developed in Kinvara. It is a prelude to modern seaweed uses and future developments in the health, food and beauty industries. A novel addition to Irish seaweed products!